…when you’re having fun or… getting older. Hey, I’m not getting older, I tell everyone I’m only 30 years old… with 25 years experience!? The reason I bring this up today is, it’s my daughters 28th birthday. I bought my CB750F about a week after she was born. That bike and I spent over 100,000 miles together. Leah has been on motorcycles since she was about 3 years old…standard stuff, riding with me…I got a ticket for having her in between me and the gas tank on the way to day care..geez..she had a helmet and gloves on!!! Then there was the time she fell asleep riding on the back. Later in years we would take longer rides on the CB750 and then my FJ1200..she liked it a lot. We had many great rides together and the day came that she wanted to ride herself. So, onto the ’59 Honda Super Cub (a 55cc Honda step through) she went. Ok, that lasted a day. Next up, the MSF course. Successfully passing that, onto what is fondly known in our family as …’The Mighty 350′. A 1971 Honda CB350. I’m a firm believer of starting new riders on small bikes. Both my kids started on that bike. I have seen and heard of far too many new riders that buy large displacement motorcycles, whether it be a sportbike or a large cruiser and trying to learn to ride it in the parking lot before heading off to home to show it off to his / her family and friends. I digress, sorry. Fodder for another post. In a short period of time, Leah was bored with the little 350 and wanted/needed more. After school one day,her older brother wasn’t home, the key was in the ignition of his Honda Hawk..you can guess what happens next. Twice as much power, better handling and way more cool looking. The hook was set. Fortunately, her brother was a good brother and gave her permission to ride the bike whenever he wasn’t. Lucky her. But…remember, this my daughter…my only daughter..and she was riding pretty fast..really good and smooth but fast…scared the bejeebers out of me. One day I even got in front of her to set a good pace, but a pace I felt comfortable with her going..Ok, I was just being a dad..anyway, when we stopped she was all over me about going slow!!?? Oops. 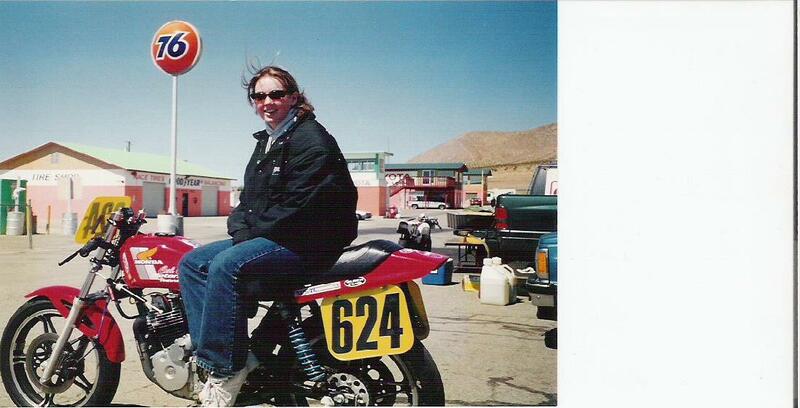 Through the 90’s I was roadracing out at Willow Springs on a Honda Ascot, WSMC and AHRMA, Leah would come out occasionally and be the pit crew along with my dad. There were a couple of women racing at that time, I would ask Leah if she wanted to try, the answer was always no…but she was a really good rider and I thought she had great potential, there I go being the proud papa again. It’s been quite a while since Leah has been on a motorcycle, college and career seem to have gotten in the way. I always hope that one day she’ll show up and say “Hey Dad, lets go for a ride”..This time I’ll ride the mighty 350. Happy Birthday Leah, it’s been the best 28 years of my life. 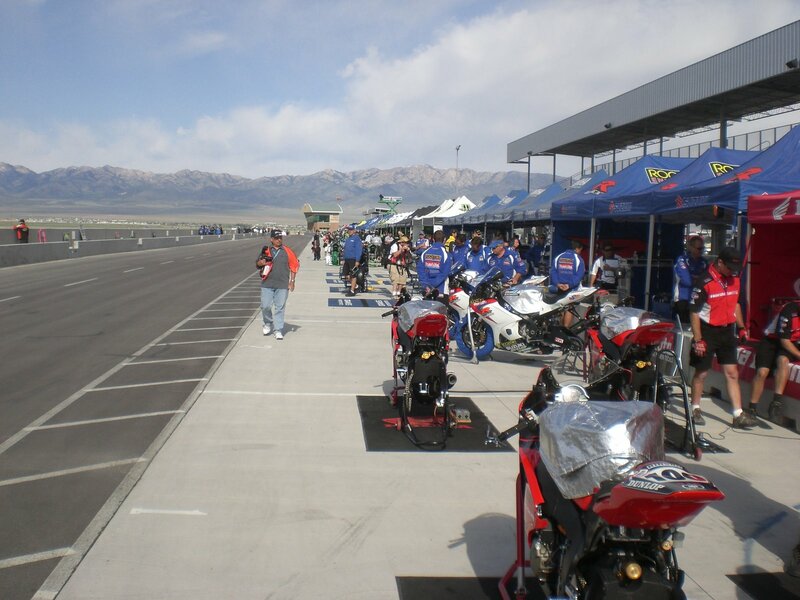 This entry was posted in Helmet Time, motorcycle racing, scooters on June 25, 2008 by themotoworld. Here we are, camera and voice recorder in hand and just stoked as can be to be at the race. I have been going to big motorcycle races for a long time and you know what..it never gets unexciting. In the stands, in the pits it doesn’t matter..the sights, the sounds, the smells (well,since the end of the 2 strokes the smells aren’t quite as wonderful..we don’t get the 125’s and 250’s here in the US…, the tension, it’s all great. I love motorcycles and motorcycle racing! We wandered the pits, the garages all around the track, getting the lay of the land. 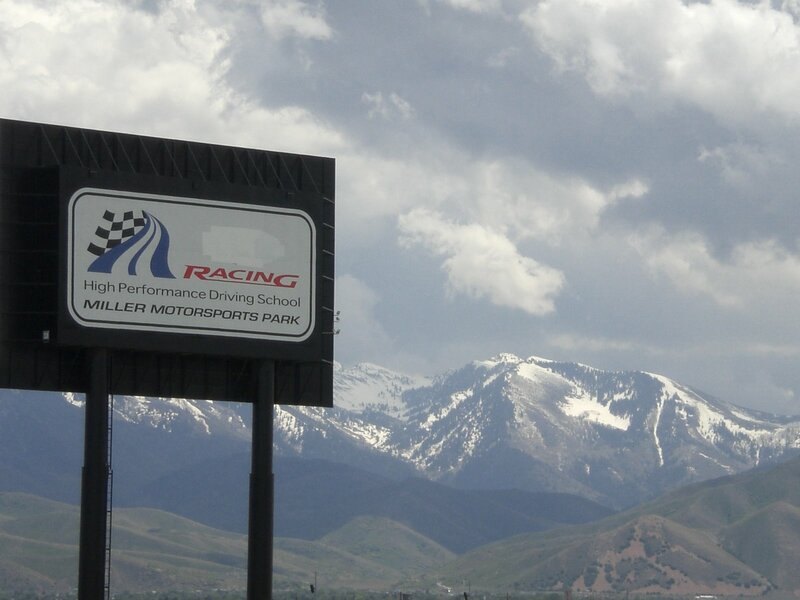 Miller Motorsports Park is a really great facility. All the staff were friendly and helpful. Our first day was great but not too productive…hey, where are all the racers??? They get off the bike, talk to the technicians and disappear. They come out of the back of the garage, get on the bike and off they go..the cycle repeats itself all day. How do we get to these guys??? 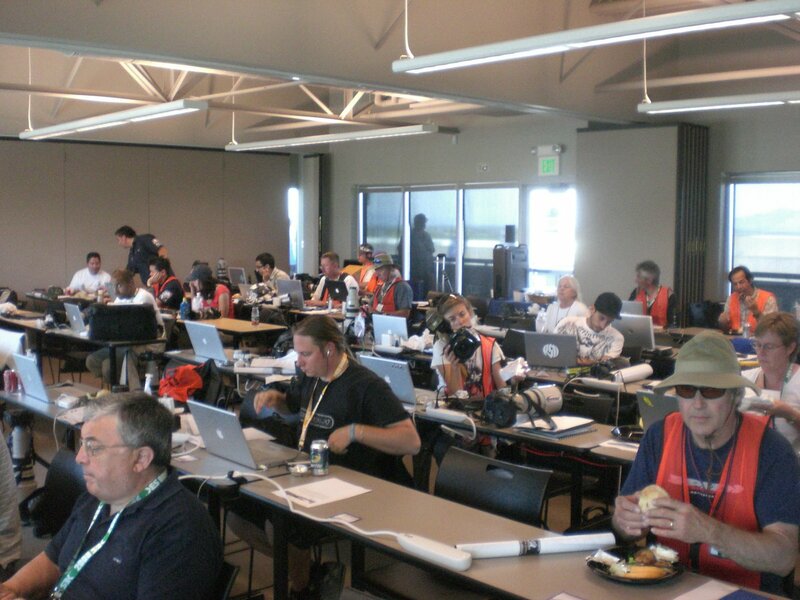 Saturday, a new day,back to the media center… more updates, press clippings, schedule changes..this is really work!!?? Down to the track, check out whats going on, over to the Pirelli press conference regarding how to run a ‘Spec Tyre’ program and learn as much as we can. Back to the media center for more updates and schedule changes and a couple of quick press conferences after qualifying. It’s time to figure out how the pro’s do it….ask the pro’s..duh. After getting some great advice off we go. Well, lets watch a race first. Photogs come in between races, upload and download photo’s like crazy. Stock up on water and back to the track. Magazine and internet journalists are watching the TV feed and typing away. Posts are sent, notes compared with other writers and catching up with friends. Back to the pit’s to get some photo’s and see if we can snag an interview or two. Lucky me..After the second WSBK practice session and a bit before Superpole, I got a couple of minutes with Troy Bayliss. A very cool guy…didn’t have a great race weekend though. The rest of the afternoon was watching WSBK Superpole and the first of the AMA Superbike race. And..more research. A great day. Sunday… more press conferences, a lot of racing. In between the races, do the interviews. Three out of four were great and one was good. You can listen to them on our podcast and you choose which one was just OK. The Honda guys were very nice and fun, Matt Mladin took time in between pictures and autographs with everybody and Ben Spies and I hung out at the Suzuki rest area. This entry was posted in Helmet Time, motorcycle racing on June 23, 2008 by themotoworld. Well,well…what a weekend!! It’s been four years since the World SuperBike circus has come to the states and I could hardly wait to see it again. The last time we all saw WSBK was at Laguna Seca and it was great so I’ve been missing it. In my opinion it is currently the best of the two wheeled racing series. In the AMA it’s generally the Ben and Matt Show and everybody else racing for third (this last weekend was a bit different with Jamie Hacking getting his Kawasaki in there for second..well Matt crashed on Saturday and just didn’t have the setup going into Sunday…but Hackers Kawa was really fast!!) MotoGP is good this year with Rossi seeming to come grips (no pun intended) with his new ‘Stones and the Yamaha developing some more speed and the bloom seems to be coming off Stoner’s rose. The racing is good but it can’t come up to the surprises WSBK can..like Carlos Checa doing the double this last weekend. And check this out..these were his first wins in ten years!!! It was great to see. Anyway, this was a very spectacular weekend in all ways. 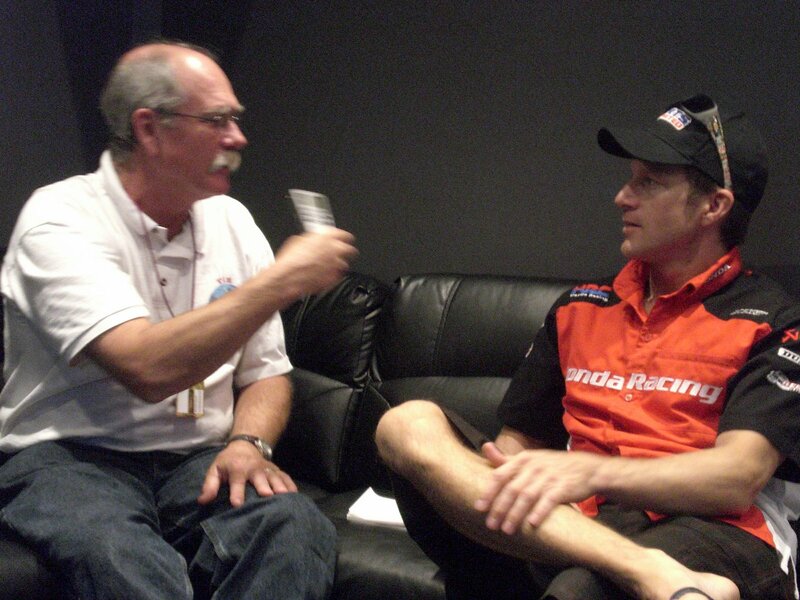 Because of the growing sucess of the Motoworld podcast http://www.themotoworld.com we decided to apply for media credntials and with the help of John Gardner of Miller Motorsports Park http://www.millermotorsportspark.com we got them. Thank you John. Load up the truck with camping gear and all our audio equipment..(uh, a little digital voice recorder, a mic and some headphones…whew, lugging around all that gear can wear a guy out…) and Heather and I are off to Salt Lake City and The World Superbike and AMA Superbike races. We’re on way as professionals now..real motojournalists! The drive was easy enough, long but easy. we arrived at the track around midnight only to find the gate to the campground closed..so, camping in the back of the truck it is. A little of Kentucky’s finest to ward off the chill and we get a few hours sleep. Needless to say, we were a bit overwhelmed. So after finding a space to call ‘The MotoWorld’ we scoured the volumes of info and then headed out to the track. What an amazing facility. Lets go find some one to interview for the podcast. Results of our search…check back in tomorrow. This entry was posted in Helmet Time, motorcycle racing on June 4, 2008 by themotoworld.